The lid has finally been lifted on Mechwarrior Online, the new, free-to-play addition to the famous fighting robot franchise. It was more than two years ago that a new Mechwarrior game was confirmed by way of a super-hot launch trailer that illustrated some of the many things that can go wrong when you go toe-to-toe with an Atlas. Today that game has finally been revealed as Mechwarrior Online, a free-to-play multiplayer mech combat sim that promises upgradeable, customizable mechs, team-based gameplay, "real" urban combat, information warfare and a whole lot more. "I think it's really the Mechwarrior you know," Piranha Games President Russ Bullock told PC Gamer. "It's fully first-person. It's not a new interpretation. We're modernizing things a little bit, I think we'll get to those questions, but certainly it's Mechwarrior." But while previous Mechwarrior games tended to devolve into circle-strafing contests in open fields, this game will sport some new features designed to make mech combat more "realistic." Multiple teams of multiple lances will be able to take the field against one another and while straight-up deathmatch is supported, it's the "conquest" mode that will be the primary focus. Also important, according to Mechwarrior Online Creative Director Bryan Elkman, is keeping all mech classes viable and attractive, rather than just turning things into a spring for the assault class. "We want to make gameplay be less about an arms race, where you start in a light Mech but you really want to get into an assault Mech because that's the best thing there is," he said. The focus on team cooperative team-based combat will go a long way toward making that happen; so will urban combat, which has never been very well-implemented in previous Mechwarrior games. "One of the things we can do these days that previous games weren't able to do well is urban combat," he added. "And it's a cornerstone of MWO, this ability to actually fight in detailed urban settings." The game will be free-to-play, but Elkman promised that doesn't mean it will be pay-to-win. "Anything that would affect or give your a tactical advantage, you can't purchase with real cash. You have to earn that by playing the game," he said. And while both Mechs and pilots will be able to follow multiple upgrade paths, it should be fairly straightforward stuff for anyone who's spent time in the breach. "If someone has played a combination of Mechwarrior, Call of Duty and Diablo in their gaming life, they're going to have seen everything that we're offering for the most part," Bullock added. 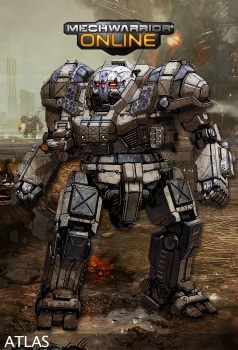 The PC-exclusive Mechwarrior Online isn't due to launch until sometime in the second half of 2012 but gamers who want to get a head start on things can find out more about the game and even reserve pilot names right now at mwomercs.com.